If the cheesy smile doesn't help you grasp the fact that fresh fruits and vegetables make me ridiculously happy, then I don't know what will. 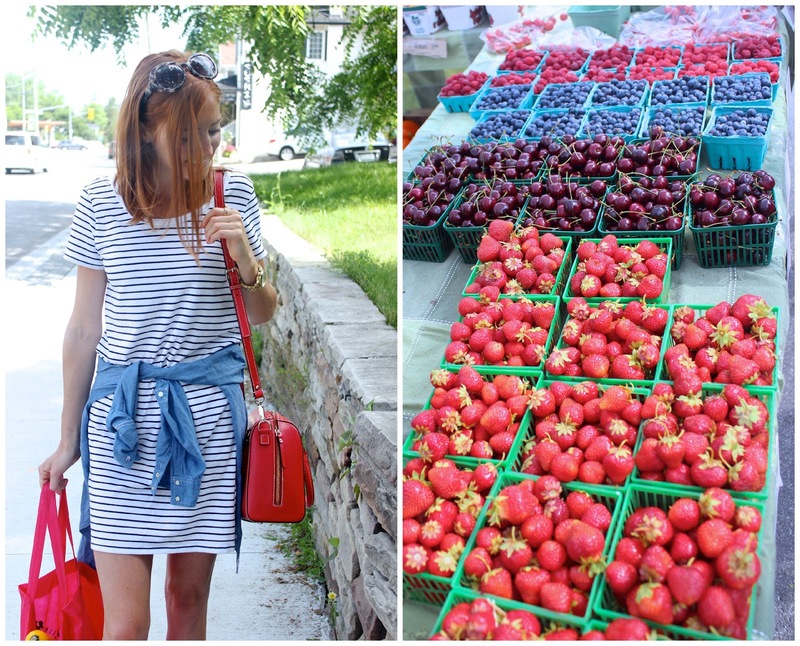 Weekend trips to the Farmers' Market are one of those summertime staple activities for me. I love the abundance of freshness, supporting and chatting with local producers and buying what is literally grown right down the road! The past few weekends I have been checking out different markets to see what goodies different towns are promoting. This weekend it was fresh herbs and veggies from the King City Market. I love how the small towns bind together and local businesses, bakeries and shops all come out to promote their goodies. The markets offer so much more these days; we're talking nuts, bread, meats and cheese, gourmet coffee, and if you're lucky there may be a food truck or two near by! I am sure you have your go-to market, but if you're looking to explore another small town Farmers' Market check out this list here. 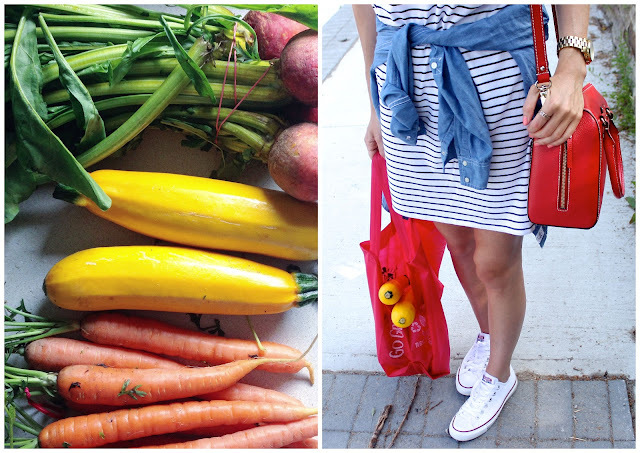 When heading to the market my outfit is typically some mix of comfy and casual. Yesterday was a beautiful, hot, summer day, so that meant a stripe dress, chambray top around the waist in lieu of a belt, and a pair of sneakers. Can't forget to bring along a re-usable bag for the goodies! Do you have a market you frequent every week, or do you enjoy checking out what other towns have going on? What are some of your summertime staple activities? such a nice casual look, love the striped dress! Thank you, Sabina! Stripes are my go-to these days. loving this outfit casual and cool at the same time ! So simple but it works! Heading over to your site as I type! Great summertime activity! Fresh fruits and veggies are a highlight of summer. Love the pics. I agree!! Working with such a fresh, colourful spread makes dinner prep so much more enjoyable! Striped dress + chambray shirt: classic weekend outfit!! Looking good!! So easy to throw on for any weekend activity.